nextItem() Move to next item. 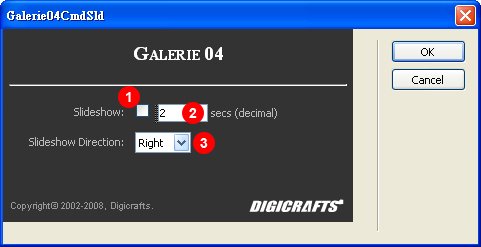 Choose Galerie 04 from the Insertbar and this interface will display. 1. ID - For the ID and Name tag for the Galerie. The default is galerie04 if leave it in blank. 2. Photo Source - For the source of photo stream in xml which can be generated by Photoshop. Select the object and the properties inspector will appear. 1. ID - For the ID and Name tag for the Galerie. The default value is galerie04. 2. Width - Width of the Galerie in pixels. 3. Height - Height of the Galerie in pixels. 4. Photo Source - For the source of photo stream in xml which can be generated by Photoshop. 5. Background Color - To specify the background color of the Galerie. If you like to set the background to transparent, leave it in blank. 6. Sub Menu - The button to open sub-menu for advanced setting of the Galerie. Click the "Appearance" button in the Inspector Interface to open this menu. 1. Camera X - Angle of X-Axis. 2. Camera Y - Angle of Y-Axis. 3. Item Count - Number of photos in the queue. 4. Photo Max Dimension - All photos will keep their aspect ratio in the Galerie. 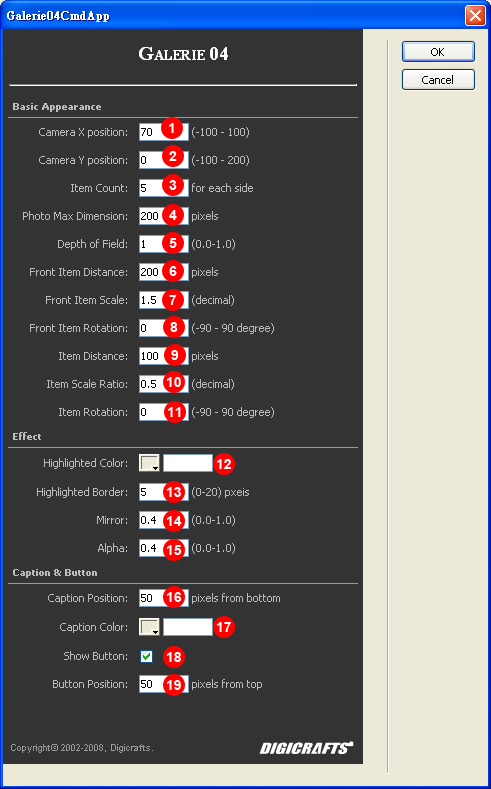 This parameter specify the maximum width and height for each photo. 5. Depth of Field - Specify the amount of depth of field effect for queue items. 6. Front Item Distance - The distance between center photo and the side photos. 7. Front Item Scale - The magnification ratio of the center photo. 8. Front Item Rotation - The degree of horizontal rotation of the 1st items. 9. Item Distance - The distance between each side photo. 10. Item Scale Ratio - Back photo scale multiply ratio. For example: The value is set to 0.9. The scale of the second photo will be 0.9 of the front photo. The scale of the third photo will be 0.9 x 0.9 = 0.81. And so on. 11. Item Rotation - The degree of horizontal rotation of the items. 12. Highlighted Color - The color change when mouse over the photo. 13. Highlighted Border - Thickness of highlighted border. 14. Mirror - Mirror effect under the Galerie. 15. Alpha - Back photo alpha multiply ratio. For example: The value is set to 0.9. The alpha of the second photo will be 0.9. The alpha of the third photo will be 0.9 x 0.9 = 0.81. And so on. 16. Caption Position - Position of caption count from bottom. 17. Caption Color - Color of the caption. 18. Show Button - Show rewind, forward and play button. 19. Button Position - The rewind, forward and play button position count from top. 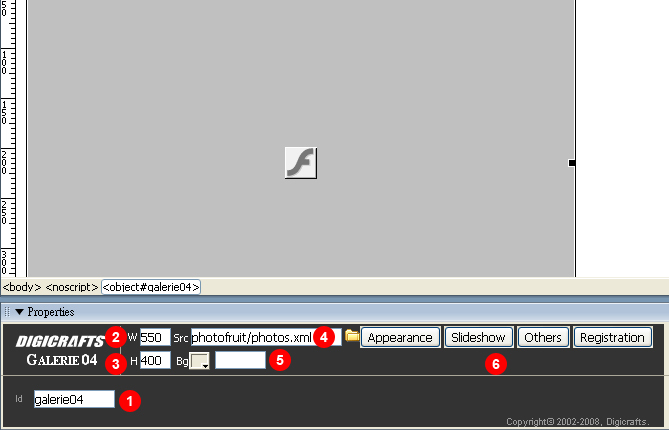 Click the "Slideshow" button in the Inspector Interface to open this menu. 1. Slideshow Enable - Tick to enable slideshow when start. 2. Slideshow Delay - Delay for each slide. 3. Slideshow Direction - Specify the slideshow start from Left or Right side. Click the "Others" button in the Inspector Interface to open this menu. 1. Transition Time - Specify the time for photo shifting. 2. Transition Type - Specify the motion curve of photo movement. 3. Touchscroll Enable - Tick to enable the drag moving function. 4. Keyboard Enable - Tick to enable keyboard left/right control. 5. Mouse Scroll Enable - Tick to enable the mouse scroll wheel control. 6. Click to center - Move the photo to center when user click on it. 7. Click to URL - Tick to enable open new URL function when click on photo. The URL should be defined in the photo source xml file. 8. Camera follow Mouse - Angle of camera will follow the mouse position. This value specify the magnitute of the camera turns. Set 0 to disable. Click the "Registration" button in the Inspector Interface to open this menu. If you did not enter the information, a warning banner will be appeared in the Galerie. 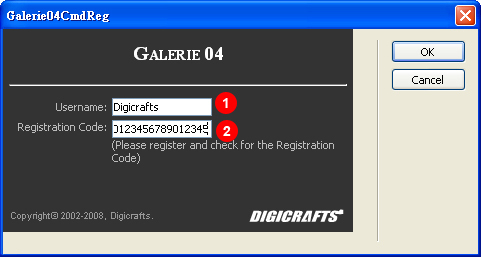 Please login to Digicrafts - The Ultimate UI for web design to register your product and get your registration code. Each license only for 1 domain. 1. Username - The username for registration. 2. Registration Code - The registration code generated by Digicrafts.